Three veterans of Ahmedabad’s guitar circuit Mr. Anup Phukan, Mr. Ashish Dave and Mr. Himanshu Desai are reuniting after a hiatus of nearly 15 years to jam to some classic rock n roll. 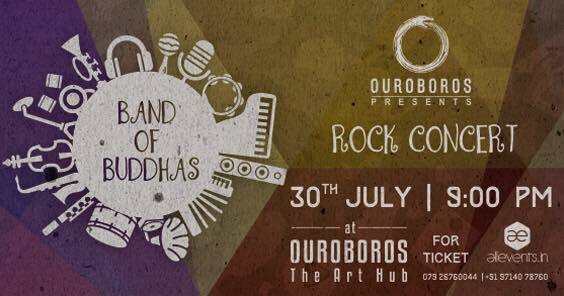 Their makeshift band is humorously titled ‘The Band of Buddhas’ (pun intended). Despite the fact that the three are not far from the dusk of their lives, they do unflinchingly adhere to the delusion that ‘you are never too old to rock n roll’. These veterans combine with them their life experiences, stories and music, taking cues from their cumulative colorful experiences that range from the hills of Assam; to the hail of Toronto; to the dry aridness of Ahmedabad. They bring with them a unique blend of musical ideas and expressions. You’ll find that there’s a mature sense of understanding with the vibe that they generate, reminding us that “Growing old is mandatory but growing up is optional”. These folks are your normal office boys – teachers, architects, social workers etc. but at the end of the day when they don their musical hats and pick up their guitars, the only sound that you’ll hear is of the joy of age old Amdavadi camaraderie. The Band of Buddhas will be accompanied by some obliging young talents of Ahmedabad’s music circuit – Mr. Dwit Hathi on bass guitar and Mr. Meet Ghadia on the drums.